The right tools to help you succeed! 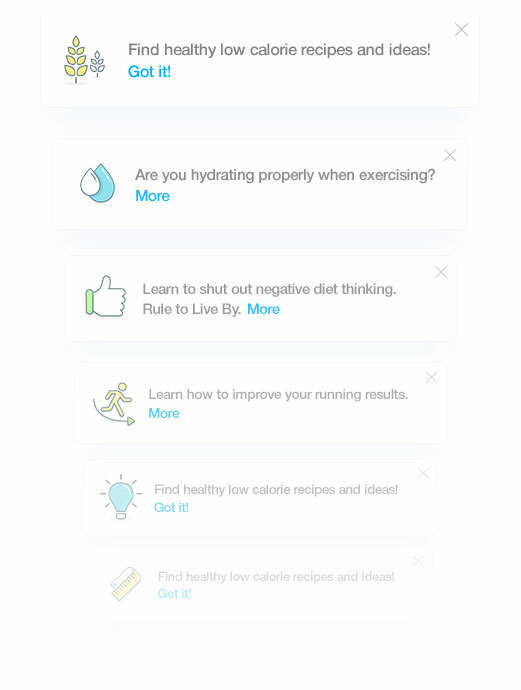 MyNetDiary Maximum has the tools that will surely make your weight loss faster and easier. MyNetDiary Maximum members report losing 2.3 times more weight than free users! One of the best tricks for weight loss is planning meals and exercise. It’s easy with MyNetDiary Maximum. Meal planning keeps you from binging when hungry and help you naturally eat better foods. 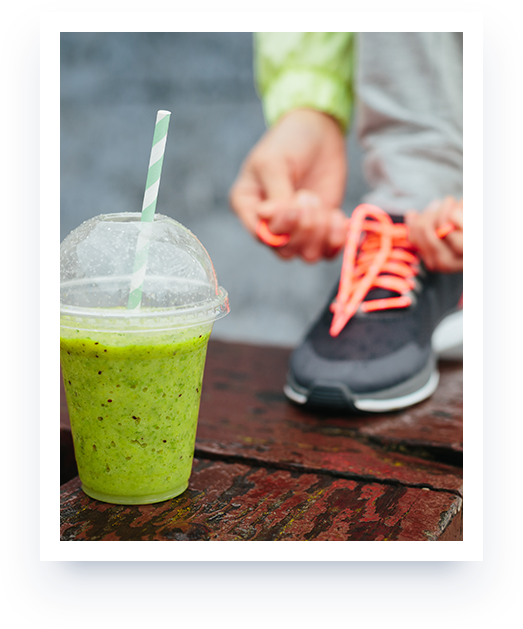 Plan your weekly exercise and fine tune your daily calorie plan to make sure you get the extra energy for planned activities. Plan your macros — fats, carbs, and protein — by grams and percentages. Feel fuller adding more protein and fiber to your diet. Dieting is only part of the equation. Activity tracking is the other. 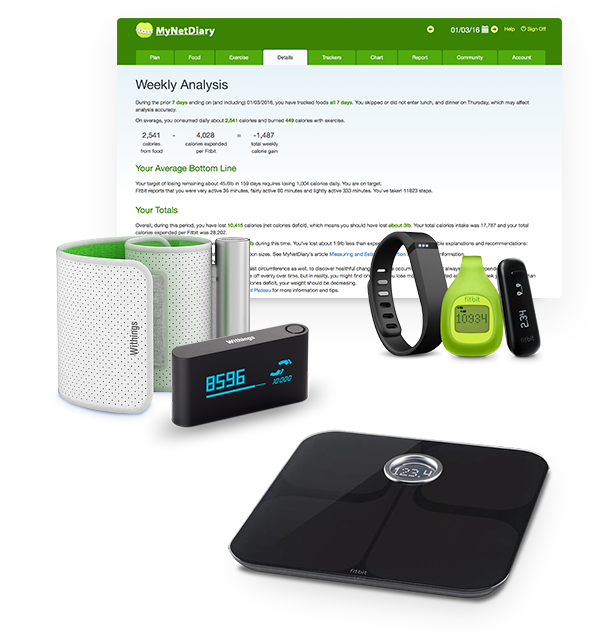 Link with activity trackers, body scales, BP monitors from Fitbit, Garmin and Withings for automatic exercise tracking, keeping an accurate track of your daily calories expenditures, sleep hours, daily step count, and more. Some days you move more, some days you move less. Every calorie counts. Give a power boost to your weight loss — make sure you burn more calories than you eat and lose those pounds! Good sleep and tracking your daily steps are super important for weight loss. Activity trackers are the most accurate way to track them. MyNetDiary Maximum can help you with managing your health conditions and taking better care of yourself. You are worth it. Medications may affect your hunger, digestion, and weight loss. Keep track of your meds and see their effects with medications tracking in MyNetDiary Maximum. Get detailed PDF reports to share with your dietitian or doctor — print or e-mail. Custom trackers can help you track symptoms and test results over time and see the trends. Custom trackers can track anything. Smart eating can be simple. 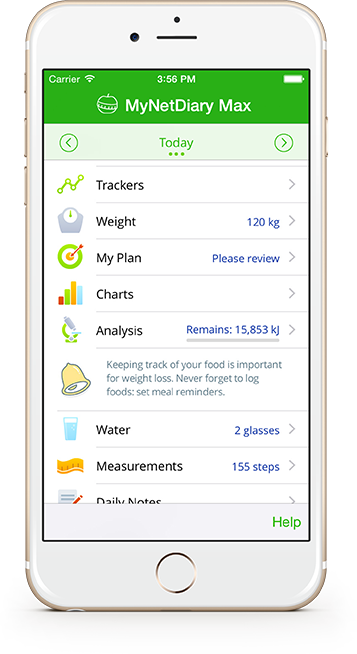 Use nutrition goals and comprehensive reporting in MyNetDiary Maximum to improve your food choices and reach your weight goal. Control carbs and stay in control of your diet. Not all fats are equal. 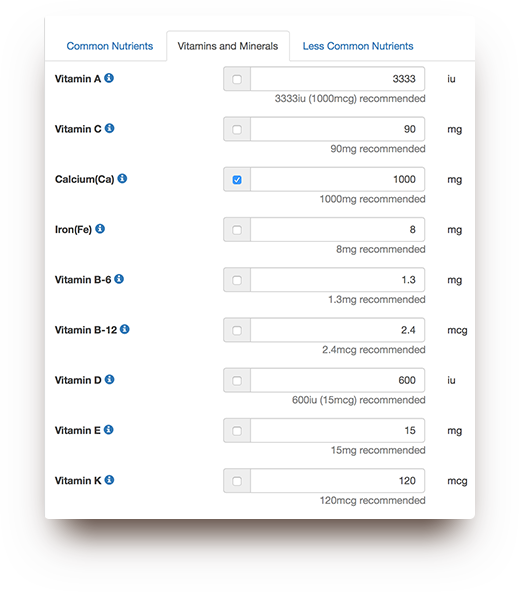 MyNetDiary Maximum can help you eat better, keeping track of saturated, trans, mono- and polyunsaturated fat. All nutrients are important, make sure you are getting enough of each. Track up to 45 nutrients. Lose weight faster and smarter with personalized tips and advice from Virtual Coach. A good advice at the right moment can change the game and make a difference. MyNetDiary Maximum has advice and guidance personalized and ready for you. Accelerate and streamline your weight loss with exclusive personalized tips and advice available only with MyNetDiary Maximum. Learn your key nutrient averages with weekly analysis to make sure you are getting enough of each nutrient. Get weekly summary progress reports to keep you on track. There is more to healthy living than just calories. Get the balanced nutrition you need: all nutrients are important. Make sure you are getting enough of each. Track and chart your body measurements over time — waist, hips, chest, thighs, biceps and more. 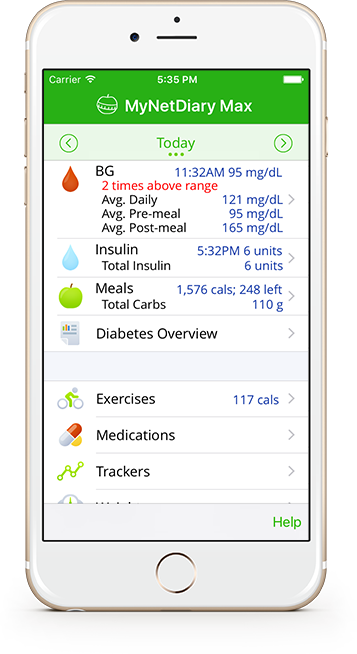 Track anything — your mood, hunger, emotions — with custom trackers in MyNetDiary Maximum to help you succeed. MyNetDiary Maximum upgrade unlocks the most advanced weight loss tools — online on the website and in MyNetDiary’s mobile apps. Most Maximum tools immediately become available in both. For example, if you link an activity tracker, it will update both the online diary and your mobile. Do you have diabetes or prediabetes? Worried about your blood glucose? Scientific studies demonstrate that regularly tracking blood glucose, having a balanced meal plan and keeping a diary can help with blood glucose control. Keep track of your BG with personalized target ranges. See the big picture with special charts and reports — you will learn what you need to change to get the results you want. We created the most advanced, modern and comprehensive weight loss program — MyNetDiary Maximum. Let us guide and support you, along with the comfortable feeling of being taken care of as our premium member. Lose weight faster and smarter with virtual coach tips and advice personalized for you. Any problems or issues? Get priority support — our support team always takes care of Maximum members first. Ad-free experience helps you focus on your goals, without distractions. We offer unconditional 14-day money back guarantee for MyNetDiary Maximum subscriptions purchased on the MyNetDiary website. For mobile apps, please check terms and conditions of the respective app store, as purchases and refunds are handled not by us, but by the app store, and may be non-refundable in some mobile app stores. Maximum membership purchased at MyNetDiary website provides the same features as in-app subscription purchased on iPhone or Android. * Disclaimer: MyNetDiary Diabetes is an educational tool, it is not a medical device, it is not a substitute for a medical device or medical care, and it does not provide diagnosis, cure, mitigation, treatment, or prevention of any disease.